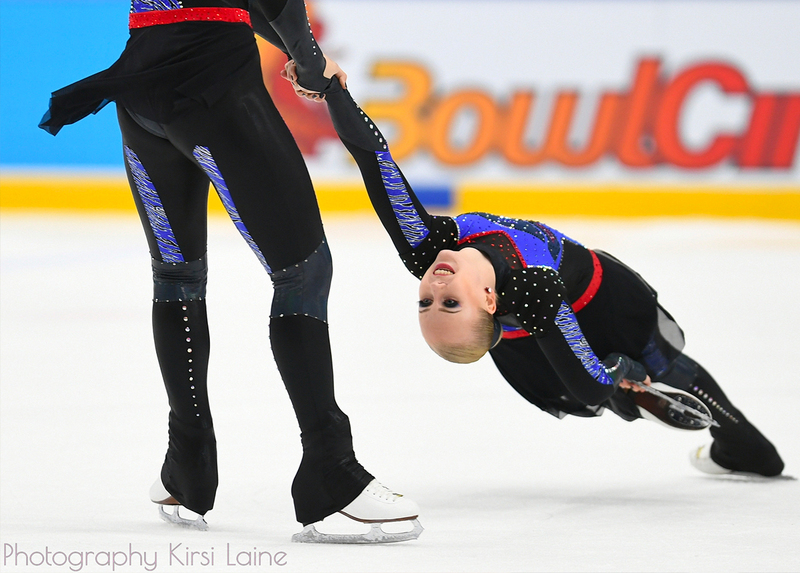 The British Championships opened on Saturday at the Motorpoint Arena in Nottingham with 852 skaters competing in 52 teams. Today also marks the first time that the event has been live streamed on BBC sport, broadcast to the entire UK; a historic development for synchronised skating in Britain. Saturday we saw the short programmes of the three British senior teams. First to skate was Team Icicles from Nottingham. They are a newly formed team and this was their first ever competition. They had a clean skate to Play That Sax by Fleur East; a very fast and confidently skated programme earning them 41.49 points and first place in the short. Skating second was Zariba from Aberdeen. Skating to Miley Cyrus, they hugely improved on their score at their last competition, earning 35.75 points and coming second. In third place was White Jewels from Isle of Wight. They had a few problems with their moves in the field element but their programme to Adele scored 33.82 points. All three scores are close enough to ensure a fight tomorrow to win the championships in the long programme. Team Icicles from Nottingham were the only competitors in this category. They skated a fast, lively programme to Disney music in beautiful purple dresses with sparkly Mickey Mouse heads on the back. They scored a huge 43.99 points. The only competitors in the Senior B category were All Stars from Slough. They skated a clean short programme in light blue dresses to Last Request by Paulo Nutini, earning them 26.00 points. There were four competitors in the Junior B competition. In first place was Solway Stars from Dumfries. They were the only team to get a level 2 pivoting block in the competition but suffered one unfortunate fall. However, they captured the audience’s attention and at several points, you could hear the entire arena holding their breath so as not to break the spell. They scored 39.68 points. In second place with 31.27 points were Whizz Kids from Altrincham, again a big improvement from their last competition. 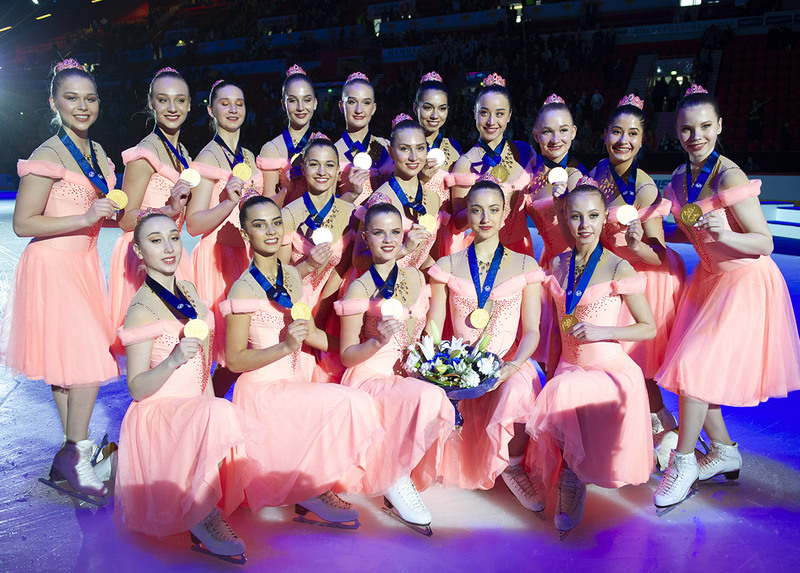 They skated in very sparkly pink dresses and wowed the audience with their Synchronised spins. In third place was Fusion from Bracknell. They scored 22.39 points but struggled with their Moves Element. It was a force competition today with thirteen adult teams all competing and only 1.71 points between 1st place and 3rd. Earning the gold medal was Starlight Rain from Stirling, scoring 23.65 points. The silver model went to Bladerunners from Altrincham, earning 23.05 points. 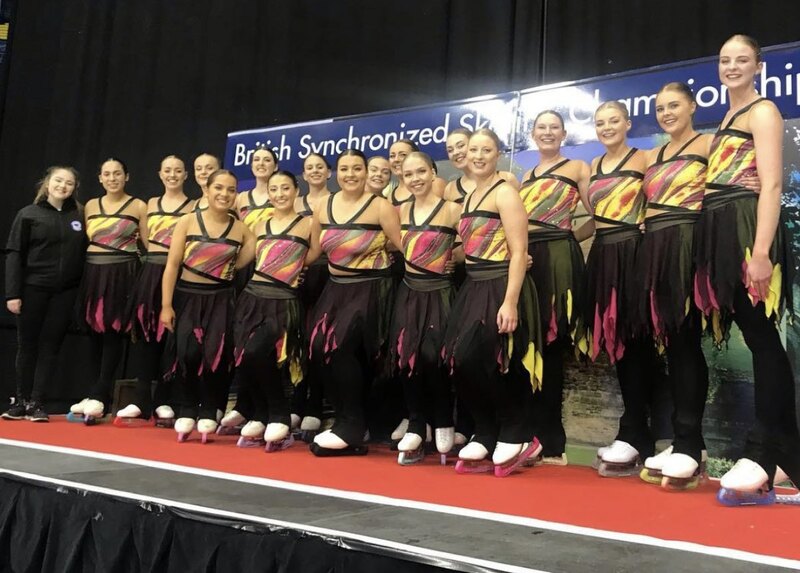 The bronze medal was taken by new team Ice Diamonds from Nottingham in their first ever competitive skate, scoring 21.94 points. In first place, by a large margin, was Ice Gems from Nottingham who skated a fierce and neat number, scoring 27.38 points. In second place, skating a Spy Kids inspired programme was Supernova from Lee Valley, scoring 20.87 points. Close on their heels in third place was Topaz from Aberdeen, scoring 20.46 points. There were 11 teams competing in this category but the clear winners, skating to Baby Shark, were the very cute Ice Pops from Nottingham, scoring 28.00 points. Second place was earned by Solway Comets from Dumfries who zipped across the ice, scoring 23.35 points. In third place was Angels from Deeside, skating to Marry You by Bruno Mars, scoring 20.41 points. Tomorrow will see the long programmes of the Junior and Senior Categories along with Mixed Age, Preliminary, Basic Novice and Advanced Novice. The whole event will be available to watch on BBC iPlayer for the next 30 days. I've been a synchronised skater for the past four years and therefore I feel like I've adopted many siblings, #SquadGoals has become a legitimate part of my vocabulary and I have pushed myself harder than I thought was possible. Aside to skating, I am a primary school teacher, currently teaching 6 year olds and brainwashing them about synchro. In my spare time -who am I kidding, what's that?- I am a big Torvill and Dean fan and follow them about the country watching their shows.